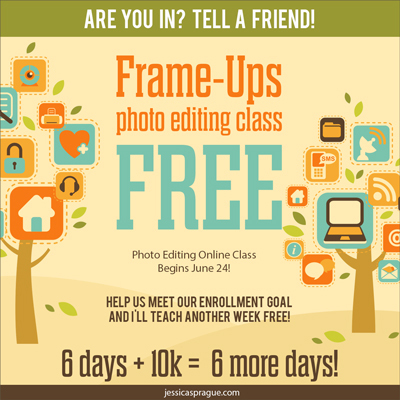 Jessica Sprague is offering a free photo editing class next week. Sign up and tell your friends! Remember, you can print your photos and your digital pages at Photo Express! Are you overwhelmed with the volume of digital images you have? Do you find it hard to manage or do anything with them? When was the last time you held a printed image of a photo you recently took, in your hands? I am going to give you a SUPER BIG hint to deal with this problem. It seems so simple at first, but trust me on this, if you discipline yourself to do this from this day forward, you will have a lot less frustration and guilt surrounding your photos, and will even get to the point where you can enjoy your photos again. If I can give you ONE hint, to help you, it would be to take a few moments after the event, and DELETE, yes, I said DELETE, some of the photos you took right in your camera. Now before you gasp in shock, read on. In the film days, you would have taken 6-12 photos or maybe even a roll of 24 photos for something really special. Now with digital, we tend to take 100+ photos of an event. You end up with 3-10+ times the volume of photos that you used to have. This becomes overwhelming to organize, edit, share, or do anything with so if you are like most people, you do nothing. Here is a good example of photos my husband or one of my daughters (not sure who) took while we were in Hawaii. Now while these are cute photos just in the fact that they are of my daughter :), I don't need 5 of them. I wouldn't do a layout with all 5 of these photos, I might include one of them on a layout, or in a photo album about our trip to Hawaii. So, looking at them, I can delete the top left one right off the bat, as I can't see her face or what she is looking at. I can then delete the other top one, because she is making a funny face and the other ones are cuter of her. I can also delete the bottom right one as it is similar to the other two bottom ones, and her face is more in the shadows. So that leaves me with the bottom left and bottom middle photos. I could leave it at this, but if I discipline myself, I would only leave the middle photo as it is very similar to the bottom left photo, but shows more of her, has a better expression, and also shows the waves in the background. So after this few minute exercise I am left with this photo. Now this is very easy to do something with - whether I want to edit it (it is much less overwhelming to edit one photo than 5! ), or upload it and print it for an album or scrapbook page. Really stop and take a moment to think about this...what if you had 1/5th of the volume of digital images to do something with?! How would that feel?! I bet you could get something done with them! Even if you only had 1/2 of the photos to deal with, you would probably feel a lot better! Doing this on a regular basis from today forward, will make the volume of digital photos that you have to deal with way more manageable and doable. Instead of having 10 photos of one "image" that you have to edit or share or print, you will have one or two to deal with of an image. This is way more manageable and doable. But you MUST DISCIPLINE YOURSELF TO DO IT RIGHT AWAY. (or at the very least asap before uploading to your computer.) I give you PERMISSION to delete photos. It is okay and will allow you to treasure and love the ones you have in a proper manner! Keep watching for more simple tips to help you in your photo life. Fresh out of unique ideas for the gift-giving season? Tired of spending endless hours on scrapbooking? Bored with putting your photos in albums? Look no further than foto depot! foto books offer something for every occasion and make the perfect gift or keepsake. Unique and filled with wonderful memories, they are truly something special. These are just a few. Your theme can be anything you want it to be. The possibilities are endless. See what you can create. Affordable and easy-to-make, foto books offer the perfect solution for your digital photos. Instead of hiding your memories, why not create your very own customized hardcover book to share with family and friends? foto books make the perfect gift or keepsake and are a wonderful way to preserve life's special moments. Your foto book can have up to 48 pages. Each page can have a different layout showing between one and nine photos (that means you can put over 400 photos in one book!). foto depot makes it even easier by automatically choosing layouts for you, based on the photos that you first select. Then you can make any changes that you wish. It's as easy as dragging and dropping your photos where you want them. This is a great feature that truly makes it simple. The result is a professional-looking coffee table book that can be cherished and appreciated for generations to come. Discover how fast, easy and fun it can be to create your very own foto book. Simply go to fotodepot.ca and begin your project in the comfort of your own home. Our simple online software makes the process painless. Just upload your photos, create your pages, and send the file for printing! The result will be a beautiful coffee table book that you can show off to all your family and friends. Get started today and turn those beautiful memories into treasures to be kept forever. PE has partnered with the fabulous digital provider Polka Dot Potato!! Download great digital kits, templates, albums and more. Unsure how to digitally scrapbook? Come to PE for a class or pick up one of the great instructional CD's or books that we have in store. It really isn't hard to do, and the computer is just another "tool" to help you preserve your memories. Remember, Photo Express can print all your digital layouts also or even turn them into a photobook! Polka Dot Potato is also having their Manic Monday 50% off sale. Remember to use the code photoexpress when checking out. Enjoy 50% off Amy Bleser's designs! Kate has been exploring the wonderful world of digital scrapbooking and is having a great time! What she loves most about it is the versatility that it offers. When she has time to play and try new things, digital scrapbooking really has no limits to what it can do. But when she's short for time and simply wants to preserve her memories, the digi world also offers some quick, simple solutions. Here are some of those 'short-for-time', 'just-need-to-get-it-done' solutions. 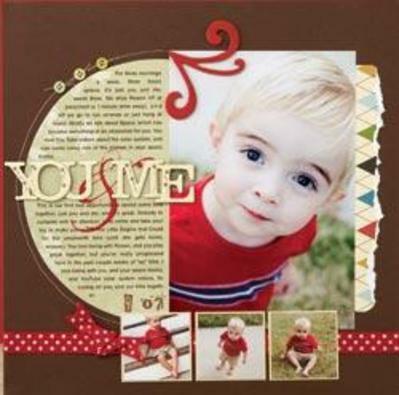 Memory Mixer is a user friendly, yet powerful program that allows you to create digital scrapbook layouts as well as photobooks. (As easy as selecting a group of photos and saying create me a book! It does the rest!) Not only does it come with all the papers and embellishments you need to create your own pages, it also comes with some pre-made pages or page templates that allow you to simply drop in your photos, add some text....and you're done! Here are 3 pre-made pages that Kate used in Memory Mixer (the first 2) and from a Beginner Digital Scrapbook Memories CD (the last one). It literally takes a few minutes and then have them printed at Photo Express. The great thing is you can print multiple sizes and copies from the same layout! She simply inserted her photos, added some simple journaling, and her pages were done. This is a great way to delve into the digi world, as it's super easy and rewards you with quick accomplishments. For those of you who aren't new to the digi world will benefit from these pre-made pages as they'll allow you to get caught up on all the digital photos that you have waiting to be printed! Not every page needs to be a one-of-a-kind masterpiece - but they do need to get done so that your memories are preserved. Again, she simply inserted her photos, added a title and some journaling, and the pages were done. Super easy, super quick, and super rewarding! Here is a great link from the CK website. Get creative with your journaling by using shaped text templates. Jessica Sprague has created four free templates for you to use on your next scrapbooking project. Simply pair shaped journaling with your main photo to draw attention to it. Want to learn more? Follow this video tutorial. You have come to trust that PE is always in the forefront of what is hot and new both product wise and technology wise. Digital Scrapbooking is creating more and more of a buzz. PE has been offering digital scrapbooking classes for a few years now - everything from learning Photoshop Elements, to using your digital camera, to beginner to advanced level Digital Scrapbooking. If you are curious about Digital Scrapbooking, watch for another Digital Bootcamp in October or sign up for some of the digital classes in September. You'll be amazed what you can do with your computer as a scrapbook tool and I've been having fun exploring this medium. You can also print your digital creations at Photo Express in any size you want, and we will mail them to you anywhere in Canada for only $5! It is often hard to find somewhere to print them in 12x12 and this is just one of the many choices of sizes you have. The quality of print you will receive will be amazing and archival and is less expensive than trying to do it yourself when you consider the cost of your paper and inks (not to mention your time). You may also want to consider turning them into a hardsided photobook perfect for gift giving or your coffee table. If you're already creating digital layouts, now is the time to get them printed on archival quality photo paper, using a fully calibrated printer. Try it out, you'll be amazed! You will also now find a selection of products to support Digital scrapbookers at PE. There isn't near as much available as for paper scrapbookers, but we are hunting it out and bringing the good stuff to you. 6 awesome CD's Digital Scrapbook Memories are in with wonderful papers and embellishments, Tinkering Ink all their paper lines available as a Digital CD, and a few other companies also have product available at the retail level that we will be carrying. Watch as this section in the store expands. Not everyone will like digital scrapbooking just as not everyone will like paperscrapbooking. Some will become hybrid scrapbookers that like to do both. Either way, you will find the support and products you need at Photo Express. Don't hesitate to come in and ask questions. Here is a short video clip from Digital Scrapbook Memories showing some of what you can do with digital scrapbooking. They also have a page full of great tips and tutorials if you'd like to learn from the comfort of your home. Enjoy!